Focal Chorus 700 speaker range on sale from May | What Hi-Fi? 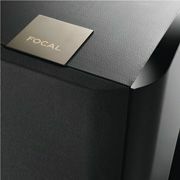 The new Focal Chorus 700 speaker range will go on sale in the UK in May, replacing the outgoing Chorus 700V models. Prices have also been announced for the new models, which will be available in a choice of three finishes: walnut or rosewood as standard, or Black Style (combining high-gloss black with textured black accents) as an extra cost option. Focal has also revealed some more of the technology behind the speakers. The mid/bass units use the company's Polyglas drive units, with a cellulose cone covered with tiny hollow glass spheres, for stiffness, low weight and consistency. Meanwhie the 25mm tweeter is an all-new aluminium/magnesium inverted dome design Focal calls TNV2. It’s mounted in a suspension system using Poron microcellular urethane, used to ensure linearity and a flatter frequency response up to 30kHz without breakup, and assembled using the surface tension of the adhesive employed, to minimise the amount required and thus the weight. As Focal puts it, ‘the masses in HF units are so low that every extra microgram of adhesive is critical to performance’. The entry-level Chorus 705 is a compact two-way design using a 13cm mid/bass unit and the 25mm tweeter: it will sell for £398/pr in the standard finishes, with Black Style at £458/pr. The Chorus 706, at £498/pr or £558/pr depending on finish, is a larger bookshelf model with a 16.5cm mid/bass unit. The first of the Chorus 700 floorstanders is the Chorus 714, using two 13cm drivers below the tweeter, one providing mid/bass, the other just bass. It will sell for £798/pr in standard finishes, or £898 on Black Style. Above that sits the Chorus 716, with a similar driver arrangement but using the 16.5cm bass units: it will sell for £998/pr, or £1098/pr in black. The flagship Chorus 700 speaker is the Chorus 726, at £1198/pr, or £100 more in black. Three 16.5cm drivers are used: one for midrange, the other two for bass. Completing the range are a centre channel speaker – the Chorus CC700, with two 16.5cm mid/bass units straddling the tweeter, at £349 in the wood finishes or £399 in black – and the Chorus SR700 surround speakers, at £598/pr in black satin. This two-way design again uses a single 16.5cm mid/bass unit, but in a slimline housing designed to be wall mounted. Polyfix wall-mounts are included. Launched today at CES 2013 is the new Chorus 700 speaker line-up from French company Focal, replacing the six year old Chorus 700V series. The new speakers have dropped the striking looks of the 700Vs, with their styling echoing the letter V in mouldings and even the shape of the speaker grille, in favour of what Focal MD Gérard Chrétien calls 'a design for the post crisis market'. Chrétien explains that the looks of the previous range were 'ideal for the time when customers were looking for statement products', whereas now 'there has been a shift to more classic design - design with longevity in mind'. The new models, which start at $495/pr for the 705 and go up to $1695/pr for the floorstanding 726 – UK pricing is yet to be announced –, retain the in-house Polyglas mid/bass drivers and aluminium/magnesium tweeter of the 700Vs. They'll go on sale between February and April. The enclosures use a combination of 18mm and 24mm MDF with structural bracing, and a new finish is being introduced for the range: Black Style (below) will combine a textured finish with high gloss detailing.